Many find that collecting vintage Christmas cards offers them a good insight into the customs of this time of year over the ages. Not only that but they can choose from a massive range, and it has been calculated that every American household sends 28 Christmas cards each year. In the UK, sales of greeting cards outstrip those of coffee and tea combined, and if you are seeking innovation then the UK is regarded as being 10 years ahead of the rest of the world in Christmas card design. After all, that is where it all started. When noted artist John Calcott Horsley printed the very first Christmas card back in 1843 for friend and businessman Sir Henry Cole, he had no idea of the worldwide custom he was about to launch. 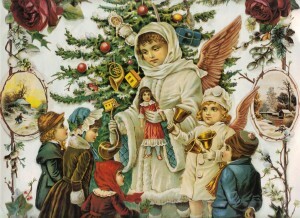 2,050 copies of this same card, showing a Christmas scene and people carrying out charitable acts, were put on public sale at Felix Summerly’s Treasure House in Bond Street, London, England, for one shilling – a significant sum of money in these days. One of these was sold in the UK in 2001 for £22,250 ($29,392.75 USD), a world record for a Christmas card. The first Christmas stamp was the 1898 Canadian 2-cent Mercator ‘Map’ stamp that was coincidentally issued at Christmas and printed “Xmas 1898” due to a long story connected with Queen Victoria, too long to relate here. That too is much prized, although it’s a pity that you will never see the two together. Those collecting vintage Christmas cards will certainly be very unlikely to come across either of these, but from these two ‘firsts’ grew a huge worldwide industry that involved printers, artists and poets worldwide vying to have their design and verse included on the top-selling cards of their day. There is still a very wide choice of vintage greeting cards available today ranging in price from a few dollars to thousands. The ‘Golden Age’ is regarded as being from the 1840s to the 1890s and Christmas cards of this era are bought and sold at very high prices. Collectors of the more expensive cards particularly prize those that are made in specific shapes, such as half-moons and circles, and also particularly prized are those designed by famous artists. When Christmas cards became in vogue in the later Victorian years, many artists wanted their names associated with the designs on the front, and as many poets wanted their poems penned on and inside them. Of particular interest are the 20th century poem cards sent out by Robert Frost to his friends, and ordinary collectors should keep an eye out for the cards printed by Louis Prang. L. Prang & Co. was America’s premier Christmas card printer until cheap imitations and mass production priced him out of business. Prang cards can still be found and are very popular with collectors. 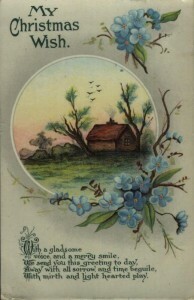 Some collectors focus on specific themes: Santa Claus, snow scenes or robins, often displayed posting cards after the nickname ‘robins’ given to the red-uniformed postmen of the day. Others collect verses written by specific poets or designed by their favorite artists. Irrespective of the theme you prefer, you are sure to find a good selection of Christmas cards if you know where to look. Collecting vintage Christmas cards, whether as an investment or just for fun as a hobby, is a highly entertaining and interesting pastime, and the following tips should help you find a whole range of Christmas cards that you can add to your collection. EBay is always a good source of any collectible, and is often the first port of call for people when they first begin collecting. However, there is more to the Internet than just eBay, and a visit to one of the online Greeting Cards Museum will give a good background on vintage Christmas Cards, and also a few ads on where to find them. Although seeking out cards online can be fun and interesting, it is much more fun to visit antique shops, checking out what Christmas cards they have in stock, and you can frequently get some great bargains there. Old antique stores that don’t specialize can be particularly rich in Christmas cards at very low prices, as can yard sales and flea markets. Although antique stores that specialize in collecting vintage Christmas cards will offer you a wider choice, you will also pay closer to the going rate and are unlikely to make a ‘find’. However, they are good for starting up a collection and learning about the subject. Another good tip is to let your friends and family know of your new hobby or passion of collecting vintage Christmas cards, and you never know what they might come across themselves and send to you at Christmas. Wouldn’t it be fabulous to open that envelop that has just come in the mail with a Christmas stamp on it and find an original Prang Christmas card – or even one of the first Horsleys! And pigs might fly, but then again. . .